Not all people are anachronic, are they? Here is one such woman. We kneel down to get to know her, drawn by her huge wrinkles and grey hairs covering her crown head. 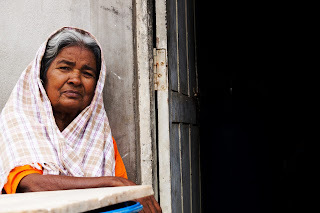 Her name seems to be quite unusual, after a second confirmation we conclude that it is "Paathi Muthu" wondering why she is covering head with towel, we proceed. 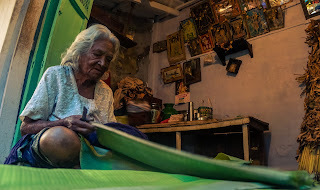 She has been living here in Kasthuri Garden under Shanthi Ashram care for nearly 10 to 11 years. She says and we quote, "Its been quite a long period here. We do not have any source of income, couldn't find one. My husband is no more, it's been fourteen years. My fourty year old son is unemployed like any other people here, making both ends meet is nearly impossible yet I thrive to", She 'sobs' not knowing how to react, we calmly wait.. sobbing turns a bitter cry.. after, she managed to continue "I deeply moan that there are no male members to backup the family, these two girls are of age 25 one is dumb and another is struck by fit. Sickly I couldn't get them married. Our lives moves on, being dependent on others. Behind the life story we think of finding the reason, but trying not to push her, we console and leave as THE HARSH WORLD OF REALITY HITS OUR SOUL .